Due to the news last month of the historical Point Reyes Shipwreck being burned down, suspected to have been done by an irresponsible photography, I decided to take a trip up the San Francisco North Bay to see the historical shipwreck, and get a few last photos before NPS hauls off the boat and have it destroyed. 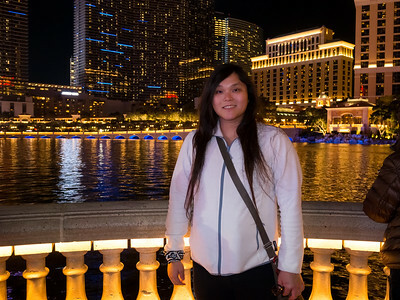 The trip was taken on 2/27/2016. The photos will be split into 3 blog posts. If you are looking for my vlog, you can find it here. If you have not heard the news, here is practically what happened. The incident seems to have happened sometime during the night between Feb. 21st to 22nd. Very early in the morning of Feb. 22nd, someone reported a fire at the iconic shipwreck, and it took the fire department 2 hours to put out the fire, and most of the stern of the boat (back of the boat) was destroyed. The next day, locals searching the internet found a long exposure light painted photo posted by Instagram user @imonlyjames that showed someone (possibly @imonlyjames himself, an assistant, or friend) spinning steal wool on fire to generate sparks to create light trails in the final shot. The photo seems to have been taken before the fire. While there isn't any proof (as Instagram does not keep EXIF data of photos), the locals and the photography community (after the news spread) suspect that it was the Instagram photographer who irresponsibly set the shipwreck on fire. The Instagram photo has since been deleted due to media attention (which in my opinion, is a sign of admitting to guilt). While this ship is considered by many locals to be a historic landmark, by tourists as a tourist attraction, and by photographers as a both an important landmark and photo subject, the fire department has said they will not further investigate this incident and won't be holding anyone responsible. Their reason? Apparently "something already damaged and abandoned can't really be damaged even further". It is rumored that NPS is currently considering hauling this shipwreck out to be destroyed as it is now structurally unsafe and people tend to go climbing on it. Full Resolution Photos: If you want to see full resolution photos of any of the photos you see here, use the following links. If you wish to purchase prints of any of the photos, please contact me here. To view my best San Francisco North Bay photos, use this link. 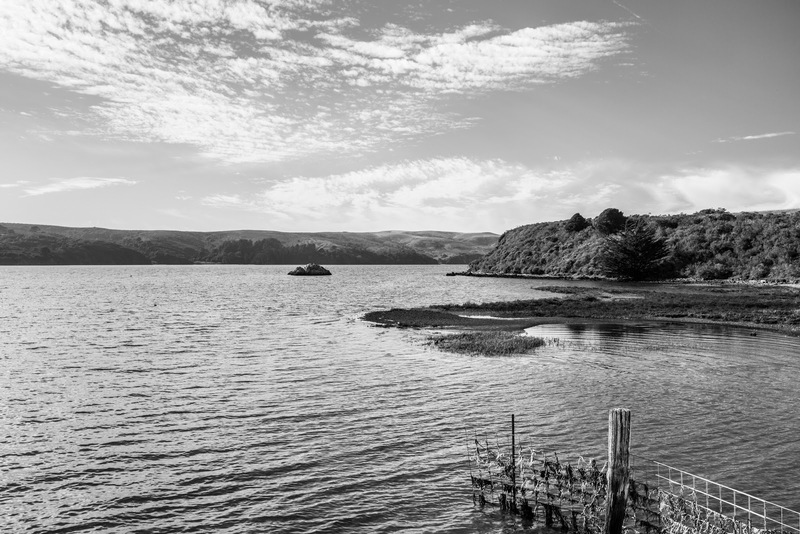 To see all of my San Francisco North Bay photos from this trip, use this link. 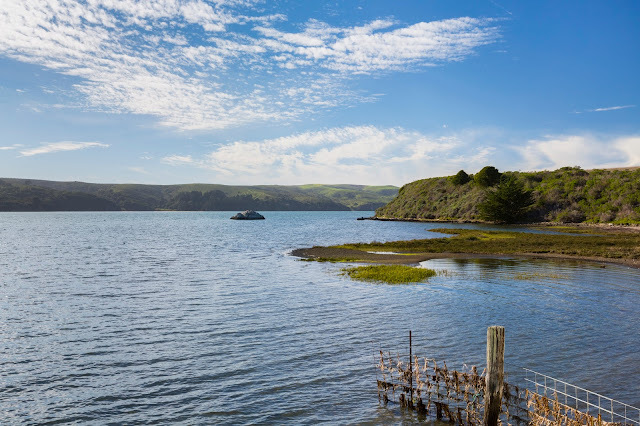 After I finished off at the Point Reyes Shipwreck, I drove to Hog Island Oyster Farm in Marshall, CA. 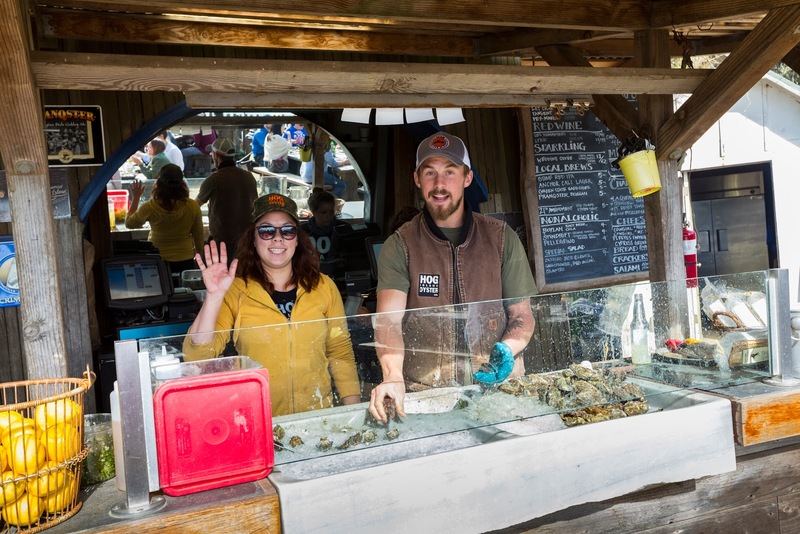 The photos for today are from Hog Island Oyster Farm. Ever since I ate at their San Francisco Ferry Building restaurant (blog post here), I always wanted to go to their farm at Marshall, CA to eat. I figured the food would be cheaper and fresher directly at the farm. 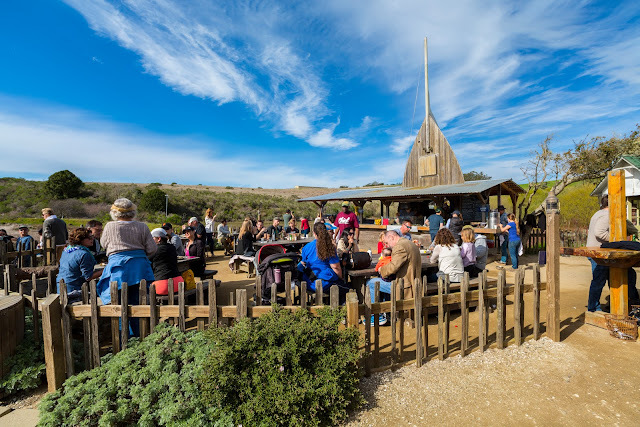 If you read my restaurant review in the San Francisco blog post, you will know this farm had a place in my head ever since I saw that Munchies documentary on the farm on YouTube. Since I was up in the San Francisco North Bay, I finally saw an opportunity for me to eat at the farm. I will tell you more about the farm and review the food in the following blog post so make sure you read! Message From The Photographer: The message in the past post was actually drafted a few days back, and it took a while for me to get around to getting the blog post finally posted. You can probably guess why that happened (because I'm very sick). Anyways, just an update. There is a good chance I didn't have the flu, but instead it turned out one of my wisdom teeth is growing out and it impacted the teeth next to it. This caused an infection and my entire lower jaw is swollen and I'm in a ton of pain. The doctor thinks the rest of the flu-like symptoms seems to be linked as she didn't find anything else wrong with me. Either way, I am in a ton of pain, I'm tired, and I could barely eat anything. The doctor ended up giving me antibiotics to deal with the infection and opioid painkillers to help me deal with the pain. While I wasn't too happy about the opioid high I got on the pills, it was still better than waking up in the middle of the nigh screaming in pain and not being able to eat because of the pain. The next day my dentist checked and told me the wisdom tooth can't be removed until the infection goes away, and I ended up getting more pain pills (non-narcotic ones so it is weaker). So pretty much I was on opioids a few days and I ended up being high as heck and totally out of everything, so I didn't really get too much stuff done during that time. The good news is the infection as reached a level where I don't need those super strong narcotic painkillers, so yay for me! I am now just resorting to the weaker painkillers I'm prescribed because those opioid ones are highly addictive. I am sort of back in working on stuff, although those weaker pain pills makes me a bit sleepy too. While I deal with all this, I haven't had time to set up my new computer (not that I could, was missing some stuff so had to order on Amazon), and my old computer, as I mentioned, is breaking on me, so everything is sort of delayed (blog post writing, photo processing). I really hope I can return on a normal schedule soon with all this stuff. Thank you for putting up with all the delays. I will be doing my best to get those Tahoe photos done. As always, you know that Amazon link I've been sharing on my other blog posts? I participate in the Amazon Associates Program, so Amazon pays me a small commission for every sale I help them make when someone uses my link. It won't cost you anything extra, and it helps support my photography, or during times like this, replace stuff that broke (like my computer in this case). I'm a college student, and this is my only source for a little bit of spending money. Thank you so much for your support and thank you so much for reading my little personal update on my life. I hope you enjoy the photos in this post. 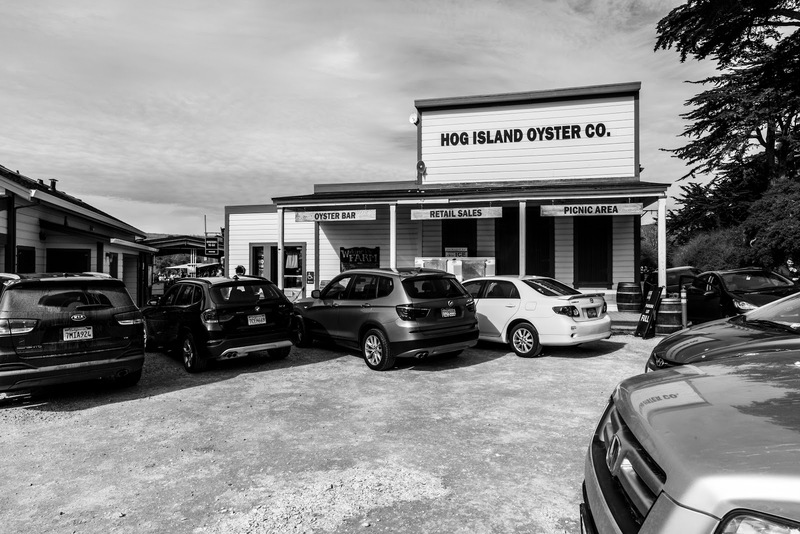 Here is a photo of Hog Island Oyster Farm from the parking lot. It tends to get really crowded on the weekend. I think on the weekend (at least the Saturday I went), they had free valet parking service. Here is the picnic area and the boat oyster bar (that building in the background). The oyster bar is only open on the weekends and it tends to be very crowded on the weekends (as you can see here). My parents actually waited in line for a while and I took that time to do some filming and some photography with my camera and phone. On week days the oyster bar is closed, but you can buy "to-go oysters" from their kiosk and eat it at the picnic area for a small picnic fee (you get an oyster knife, a bottle of hot sauce, a lemon, a lesson on how to shuck an oyster, and a place to sit). The "to-go oysters" are a lot cheaper as they are raw and you have to open them yourself. You can picnic during the weekend too, but as you can see, you may have to wait a while for a spot instead of just buying and sitting down. 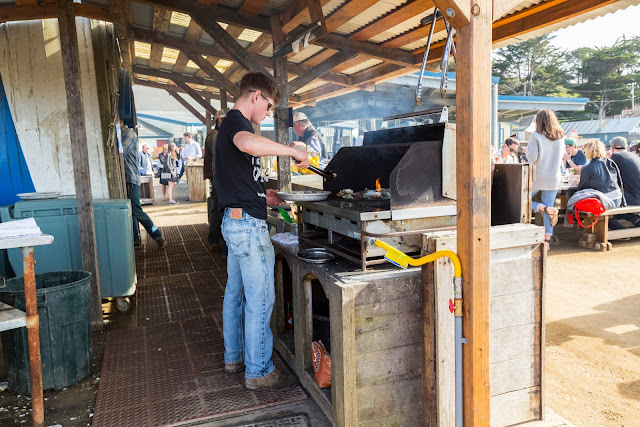 Here is one of the cooks at the farm barbecuing oysters at the oyster bar. The place is pretty laid back. 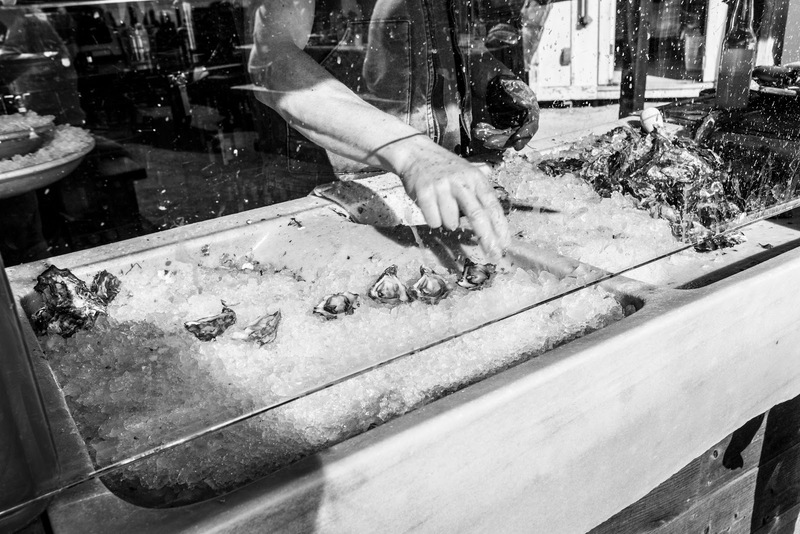 Here is a photo of one of the oyster shuckers shucking oysters at the oyster bar. 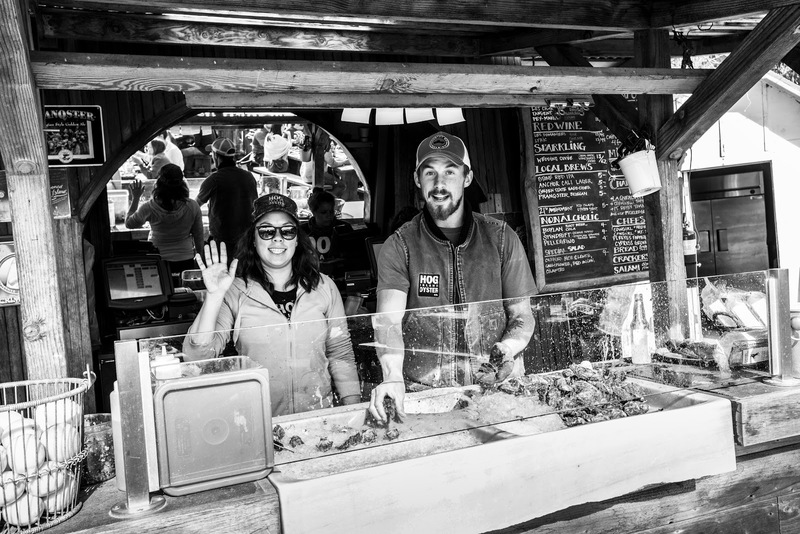 Here is a photo of one of the waiters waving at me and one of the oyster shuckers shucking oysters at the oyster bar. Another photo of the oyster shucker shucking oysters at the oyster bar. I ordered a few barbecued oysters for my parents and I. They were delicious. We drank some ginger beer with our food. The food at the farm is top notch. 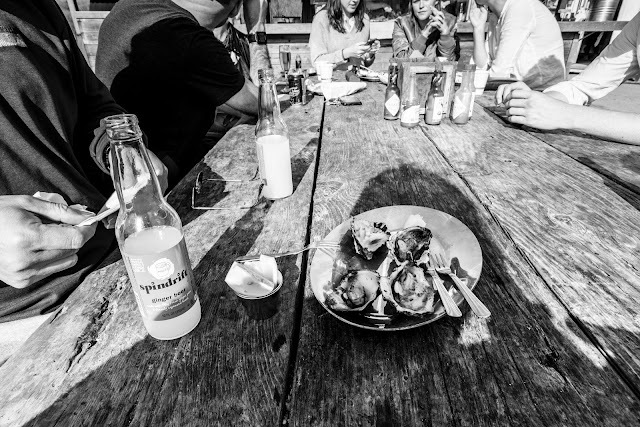 You can really taste the quality and freshness of the oysters. 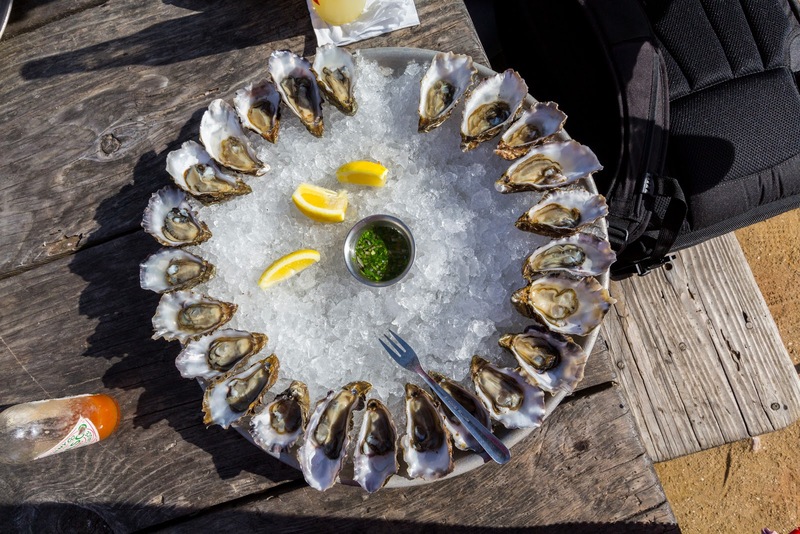 As for the pricing at the oyster bar, it is fairly expensive and comparable to a higher end restaurant. If you want to eat at the oyster bar, be ready to shell out money. As I mentioned earlier, the "to-go oysters" are a lot cheaper and you can eat at the picnic tables for a small picnic fee. I guess they open up the oyster bar on the weekends to make a bit extra money from tourists passing by as this place is pretty famous. A plate of two dozen raw oysters. We got it already shucked so it was more expensive (and this already shucked plate is only available when the oyster bar is open). The raw oysters were very fresh and delicious. I have ate oysters from my local Chinese supermarket before and I have to be honest, those tasted horrible. These fresh from the farm oysters are the best I've ever ate. These taste as fresh as the ones I got served at the San Francisco Ferry Building restaurant. 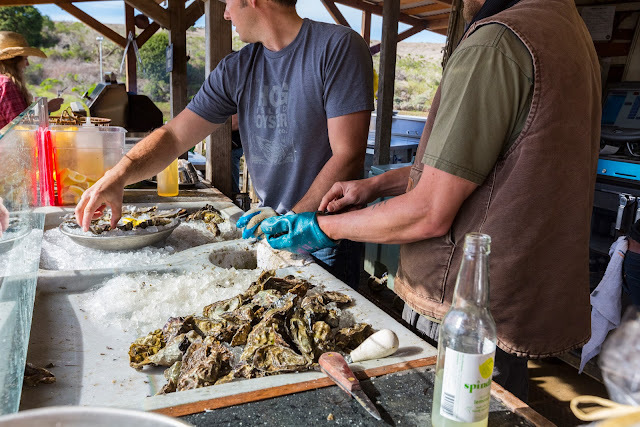 The farm maintains the quality of these oysters well. 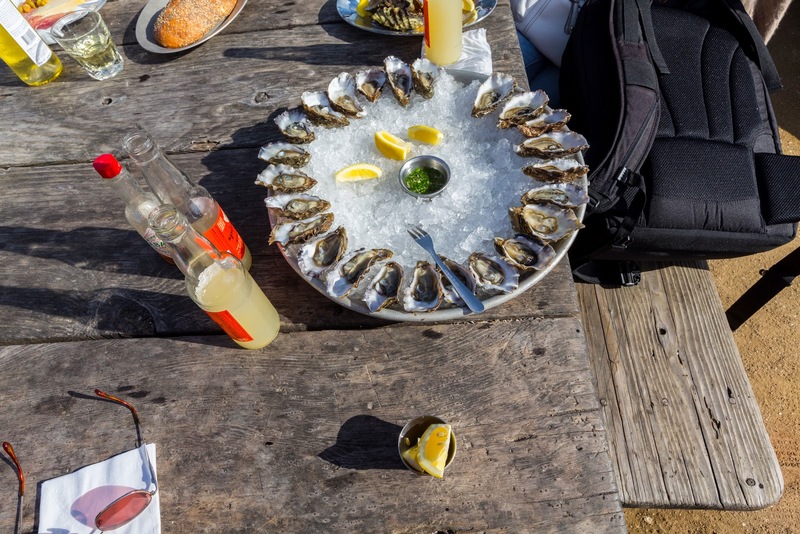 Another photo of the plate of raw oysters. A photo of the oyster holding tanks at the farm with the people lining up for the oyster bar in the background. 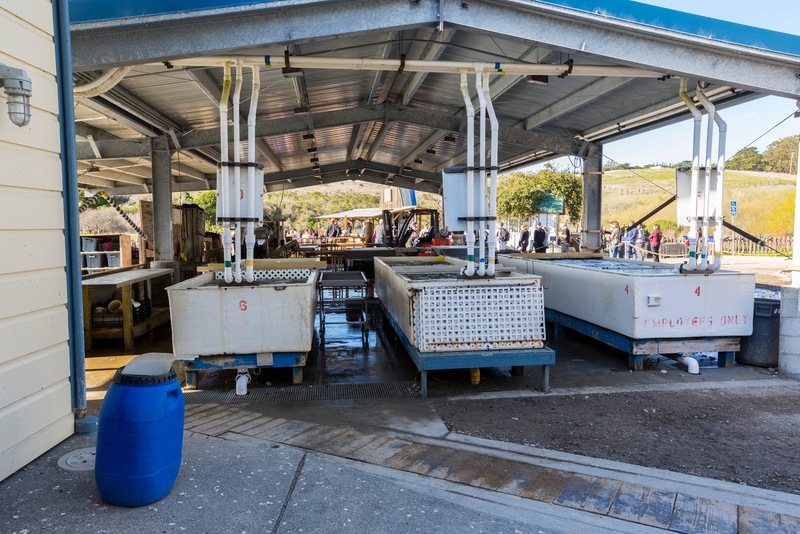 The oysters are not farmed in these bins, but is farmed out in Tomales Bay. These are holding tanks for the oysters after they have been harvested. If I remember the documentary correctly, this is the area where they sort oysters by size and get rid of any non-oyster debris that may have gotten trapped in their harvest. 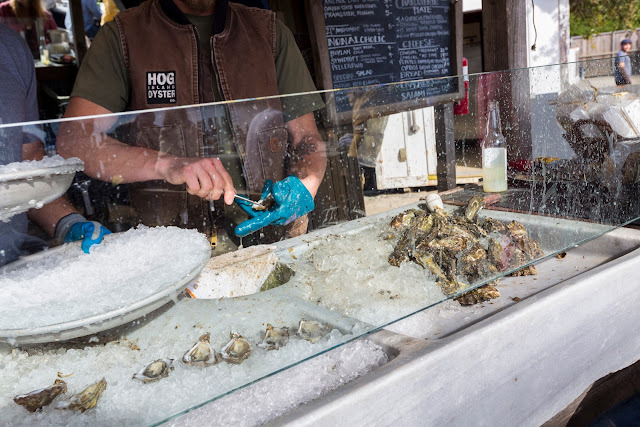 For "to-go oysters", you can buy different size oysters along with different species of oysters. If I remember correctly, they are sold by the dozen. They have a kiosk near the entrance where you can buy that. Here is a photo of Tomales Bay from the parking lot of Hog Island Oyster Farm at Marshall, CA. My trip to the farm was great. The food was very fresh and tasty. The only thing I did not like was the price of food. I can somewhat understand the price point for the Ferry Building restaurant in San Francisco as the real estate there is very expensive, but considering how the farm is out in the middle of no where in Marshall, CA, I have to say the price of the meal is not friendly. I still enjoyed my visit though. Next time, I might just stick with "to-go oysters" and shuck them myself instead of eating at the oyster bar. My final suggestion, if you have time, try to head there on a week day when it is less crowded if you hate waiting. Shucking your own oysters isn't hard, and they teach you how to do it with the picnic fee. Also there are several other oyster farm places on Highway 1 that could be cheaper than this place (although I did not visit any of those before). I saw quite a lot of people lined up outside a few of them on my drive that day, so I guess they are good places to eat at too. This is all the photos for today! 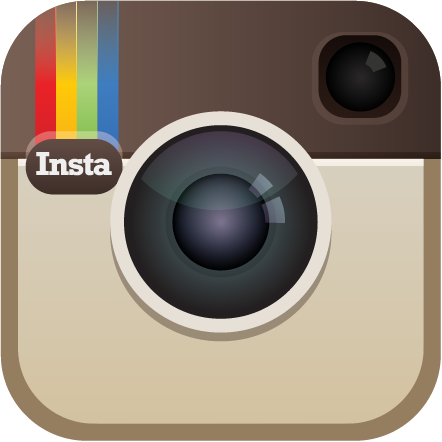 I hope you have enjoyed the photos! In the next blog post, I will have photos from Dillon Beach and Highway 1. There will be lots of sunset photos. Please don't forget to share with your friends and family members! Also, if you want to get notifications when I post up more photos, "Like" us on Facebook or follow me on Twitter and Google+. These links can also be found on the top of the right sidebar.